Some good news to report regarding consumer protection. And news that it is illegal to imply that other therapeutic goods, including vaccines, are harmful. Unfortunately, it has become all too common commonplace that SCAMs (Supplementary, Complementary and Alternative Medicine) make unsubstantiated claims about their products and services. It has also become commonplace that they get away with making such claims, seemingly without consequence. “Health practitioners not to make claims to cure certain serious illnesses. (1) A health practitioner must not hold him or herself out as qualified, able or willing to cure cancer and other serious illnesses”. So it was a surprise to see this happen today. This is the work of a sceptical colleague, Michael, who issued a lengthy complaint to the Complaints Resolution Panel of the Therapeutic Goods Administration some time ago. Recently he received a 9 page facsimile advising that his complaints about Arnica Montana, a purveyor of homeopathy, regarding breaches of section 4(1)(b), 4(2)(a), 4(2)(b), 4(2)(c), 4(2)(d), 4(2)h, 4(2)(i), 4(7) and 5(2) of the advertising code were deemed valid. Arnica Montana Enterprises Pty Ltd were instructed to comply with the following sanctions: Withdrawal of Advertisement, Withdrawal of Representation and Publication of Retraction. This involved publishing a retraction on the website which appears below. The advertiser was given an opportunity to respond to the criticisms, and rejected the allegation that there was “anything deceptive or misleading” in the advertisement/website. 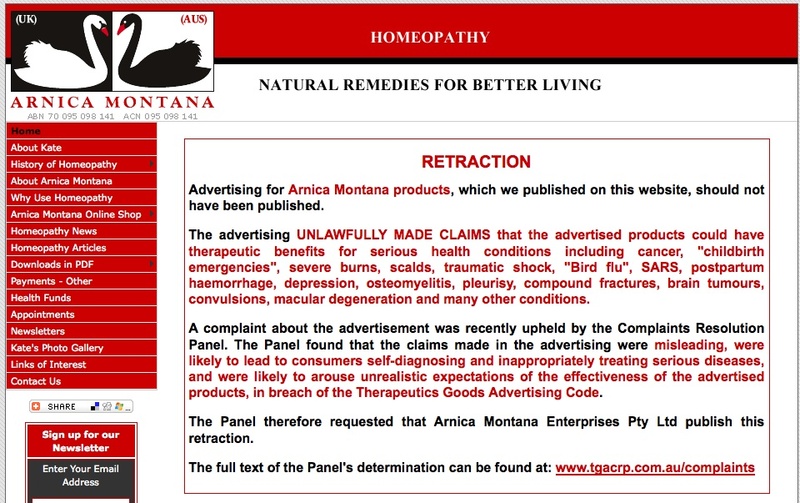 The advertiser claimed that the website was “intended to be an information website to educate the public about the use of homeopathic remedies” but not to the exclusion of any other system of medicine. But The Panel found that the advertisement breached sections of the code which prohibit advertisements for products that “abuse the trust or exploit the knowledge of consumers” and was “likely to arouse unwarranted and unrealistic expectations of product effectiveness”. This was based on the finding that “the advertisement included claims of benefits in relation to burns, scalds, pain, traumatic shock, severe burns….no persuasive evidence was provided that the advertised products could have benefits in relation to the wide range of conditions referred to”. Evidence? Why do you need evidence? The advertiser stated “controlled trials cannot be used for homeopathy but [that] there is a mass of unpublished evidence” and stated that they “would be grateful to know which section of the Code requires published scientific evidence as a precondition to advertising”. Besides they have testimonials all over their website…but wait, they were called into question too. The Panel stated that the advertiser did not provide evidence that any of the testimonials in the advertisement were genuine. “the calendula cream I make is specific to cancer skin keratoses and I have successfully treated many of these and established melanonas by using the sage cream at night and the calendula during the day”. Interesting that it unlawful to publish testimonials that are not genuine or “atypical”. This could apply to many a woo website. If you search the website for vaccination, you will get hits for the Australian Vaccination Network (AVN), Meryl Dorey and other misinformation that we have come to expect from the anti-vaxers. (Who would have thought, a homeopath condemning vaccination). I wonder where does the AVN website sit with respect to this? Would their website be deemed an advertisement? After all, they do sell literature and DVDS, but I suspect these products do not come under the auspices of “therapeutic goods”. An advertisement is defined by The Code “…to include any statement, pictorial representation or design, however made, that is intended, whether directly or indirectly, to promote the use or supply of the goods”. This is why the entire arnica montana website was deemed an advertisement; the Panel noted that it was clear that the website offered a range of products for sale, and was satisfied that the website as a whole constituted an advertisement for therapeutic goods. Interestingly, the complaint summary cites the subject matter of the complaint as “website advertisement” and the sanctions as “withdrawal of advertisement”, thus implying the entire website is to be withdrawn. If you go to the website, you will see the published retraction, but the remainder of the website still functions as normal. And if you think there’s no harm in homeopathy, then see this story. 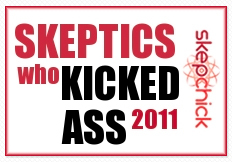 « A register for quacks and bad science journalism.